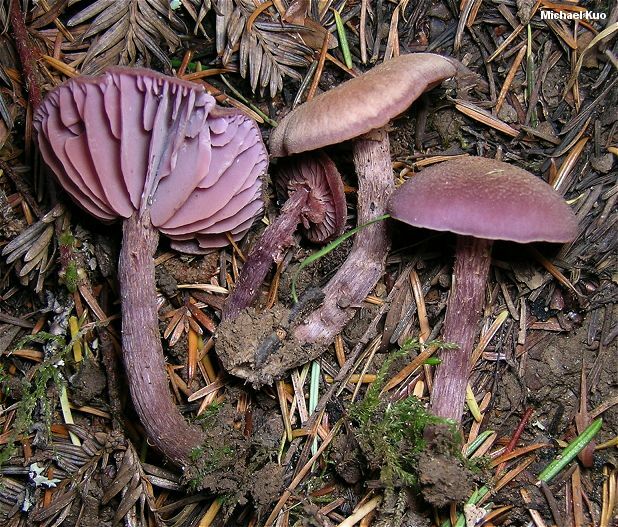 Look for this beautiful mushroom under conifers, west of the Rocky Mountains (for a similar species east of the Rockies, see Laccaria amethystina). 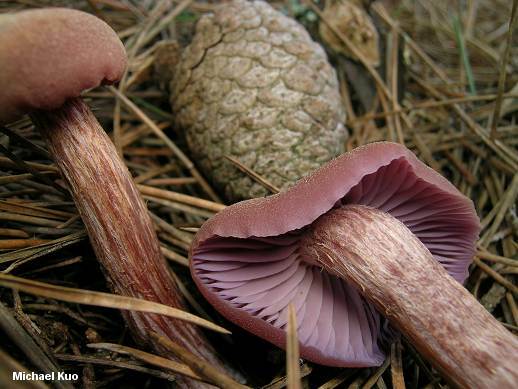 When young, Laccaria amethysteo-occidentalis is easily recognized by its deep purple cap, thick purple gills, and its long, shaggy to grooved stem. It has a white spore print, which helps to separate it from some Cortinarius species that are superficially similar. This mushroom previously went under the name Laccaria amethystina, but was separated on the basis of its darker cap color, larger size, and spore morphology. 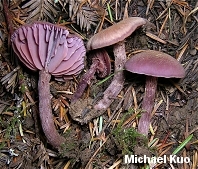 Its range is limited to the west (under conifers), while Laccaria amethystina appears east of the Rocky Mountains in association with hardwoods. 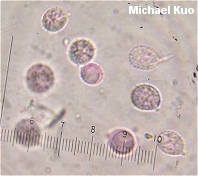 Ecology: Mycorrhizal with conifers; growing alone, scattered or gregariously; common; usually appearing in colder weather; west of the Rocky Mountains. Cap: 1-7 cm; broadly convex, becoming nearly flat; often with a central depression; the margin even or inrolled, not lined or slightly lined when wet; nearly bald, or finely hairy-scaly; deep purple, soon fading to brown or buff. Gills: Attached to the stem; distant or nearly so; thick; sometimes appearing waxy; dark purple, fading to lilac. Stem: 1.5-12 cm long; 0.5-1.5 cm thick; equal or slightly swollen at the base; strongly grooved; often coarsely hairy or scaly; purplish or paler; with purple to lilac basal mycelium. Flesh: Thin; purplish to whitish. 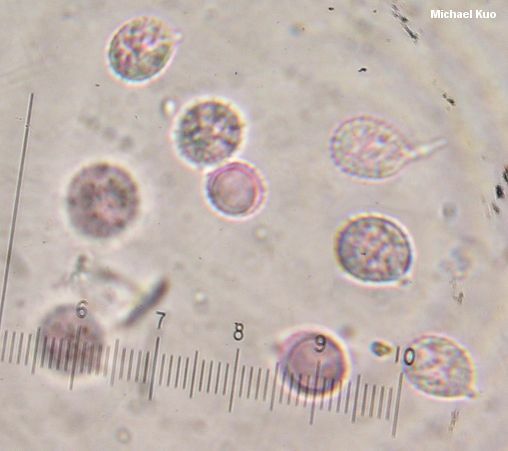 Microscopic Features: Spores 7.5-10.5 x 7-9 µ; subglobose or broadly elliptical; ornamented with spines 0.5-1.5 µ long and about 1 µ wide at their bases; inamyloid. Basidia 4-spored. 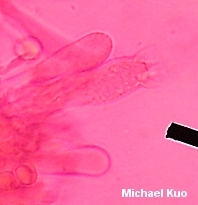 Cheilocystidia usually present; subclavate; to about 65 x 18 µ. Pileipellis a cutis of elements 7-16 µ wide, with scattered bundles of upright elements; terminal cells subclavate to clavate. REFERENCES: Mueller, 1984. (Arora, 1986; Phillips, 1991/2005; Mueller, 1997; Trudell & Ammirati, 2009.) Herb. Kuo 01170501, 01121105.